Albert Camus has rightly written, “A man without ethics is a wild beast loosed upon this world”. Can you imagine what will happen if a wild beast is left without any control upon the society? The same thing will happen if you do not follow any ethics in your life. As most of us know, Martial Arts training generally helps people to grow both physically and mentally. Similar to other martial arts, ethics are important in Taekwondo as well. When learning any type of martial arts inclusive of Taekwondo, an individual can look at his personal ethics like treating the fellow being in the right manner or he/she can look at social ethics. Fundamentally, all ethics come down to a single point. In short, it is nothing, but the difference between good and evil. In general, many of us relate Taekwondo as a sport that is aggressive in nature. But, does this mean that the learners can become aggressive? No one wants to be aggressive, right? The learners wear protection gears in this technique because they should not hurt others and also they should safeguard themselves from getting hurt. Rather than seeing this sport as an aggressive sport, it should be viewed as a sportive sport. The motto of taking part in a Taekwondo session is not to hurt others, but to understand one’s own strengths not just physically, but also mentally. The goal of learning this technique is to achieve harmony not just with oneself, but also with nature. By learning this technique, one can gain the ability to control both good and evil that are denoted as yin and yang respectively. 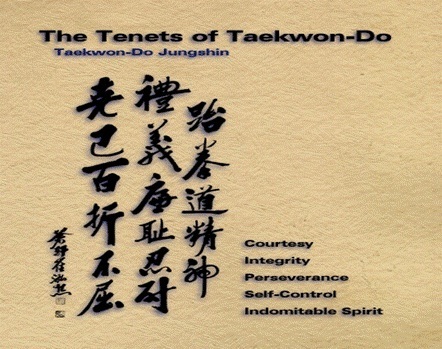 A true Taekwondo student knows well as to how to behave in different situations with utmost integrity. In short, Taekwondo training sessions are not just aimed at improving skills of self-defence, but it is a way of life. One can gain better self-confidence by getting trained in this technique. However, remember that it should not turn out to be a false sense of superiority. 1. Courtesy: Remember that people learning this technique are expected to be polite to the fellow students. They should respect others and they should have good features like politeness, good manners, humility and kindness. 2. Integrity: An individual with integrity can define what is wrong and what is right. In addition, such a person has the quality to admit when he/she has done something wrong. It is expected that an individual taking up Taekwondo training should strive to be honest and should lead the life with moral principles. 3. Perseverance: Patience is a crucial quality that a person planning to learn this technique should develop. One of the important secrets of successfully learning this technique is to face each difficult situation with the utmost patience. When an individual practices perseverance in little things, he/she can do the same in situations that hold great importance. 4. Self-Control: When he does not have self-control, a Taekwondo trainee can turn out to be a street fighter. When the individual does not have self-control, it can turn out to be disastrous not just in personal life, but also in professional life. 5. Indomitable spirit: This means never leave a stone unturned attitude. Yes, an individual planning to get training in this technique should have a never give up attitude. He might face insurmountable odds and only the right indomitable spirit will help him face the challenges. How to behave in the Dojang? A clean costume should be worn. The uniform worn by practitioners of Korean Martial Arts is called as Dobok. What will one learn from a basic Taekwondo training? So, not just after learning Taekwondo, but to enroll oneself in such a training session, some ethics are important.